“The Ultimate Fighter: Live Finale” took place Friday inside The Pearl at Palms Casino Resort in Las Vegas, Nevada. For the second straight fight, Martin Kampmann (Pictured) rallied to collect an impressive win against a top tier welterweight. This time, it was Jake Ellenberger who found himself on the business end of Kampmann’s assault. After getting dazed and confused in the opening round, Kampmann unleashed some knees to “The Juggernaut’s” grill to earn a knockout victory. Michael Chiesa served up an upset special by submitting Al Iaquinta to win the ‘TUF: Live’ tournament in the show’s co-main event. UFC president Dana White did not attend the presser. UFC officials reported 1,628 fans packed the venue, garnering a live gate of $195,250. 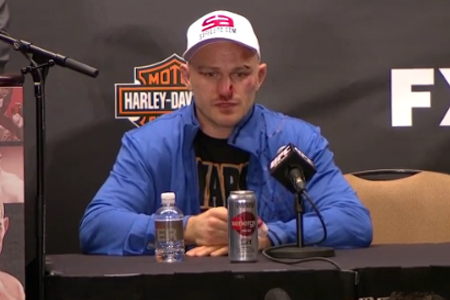 Kampmann says you can never count him out in a scrap. He wouldn’t mind fighting Johny Hendricks even though they trained together many moons ago. Kampmann is down to face Hendricks, Carlos Condit or Georges St-Pierre, but he’s taking a vacation back home to Denmark first. Ellenberger stayed classy, but it was clear he was upset about the stoppage. He said he could have continued fighting and would have liked the opportunity, though it was Kampmannn’s night. Chiesa claimed he’s not celebrating too much because he wants to win fights in the UFC. Iaquinta was very classy in defeat by saying he was happy for Chiesa.